At its core, our bedroom serves as the ultimate respite from the challenges of everyday life. It’s where we start and end each day and can savor a rare moment of solitude away from roommates, family, or simply bustling city life. So, naturally, the way we choose to decorate and personalize that space is crucial. If your bedroom feels dated and uninspired, there are a number of ways to give it a quick refresh in time for fall. Ahead, we scoured Pinterest and the domino home tour archives for the best bedroom ideas and inspiration. From tiny rooms overflowing with plants to master bedrooms painted in bold and moody hues, these stunning bedrooms are the ultimate starting point to redecorate your space. Roll up your sleeves and try one of these 17 bedroom decorating ideas this weekend. Trust us: they’re truly transformative. Think of white walls as a blank canvas—they’re the perfect opportunity to get creative and inject personality. The trick to making this stunning wallpaper moment work? Choose one or two tonal moments from the wallpaper’s motif and invest in bedding and textiles in similar hues. Just when we thought that gallery walls had their moment, this jaw-dropping master bedroom swoops in to tell us otherwise. With its nautical theme, this beach house bedroom makes a classic white and blue color palette rich and inviting. Choose art that reflects the surrounding landscape for a complementary twist. Bonus points if you can position it by a window. If there’s one thing we learned from Hilton Carter‘s cotton mill-turned-plant-heaven-loft, it’s that there is no such thing as too many plants—especially when it comes to the bedroom. The addition of vibrant greenery can uplift even the most tired decor scheme. Far too often, we find ourselves gravitating towards neutral paint colors and shying away from a daring scheme. Allow this bold charcoal and red bedroom to serve as the inspiration to choose an untraditional scheme. Don’t be afraid to go all out with color—and yes, the primary wheel is key here. Rather than adhering to the classic red, yellow, and blue combination, opt for muted tones and allow this personality-packed bedroom to be your inspiration. Consider this modern simplicity at its best. Skip the superfluous and opt for a setup that includes just the essentials. Complete the look with textured baskets or quilts and a vase of greens for a chromatic pop. Here, a French-tufted mattress stands in as a headboard alternative, acting as a chromatically and texturally rich detail. Blues rule in this textural bedroom filled with an eclectic array of prints and patterns in moody tones. Embrace a tightly curated color scheme to replicate this look. There is no rule for sticking to one decorative style, especially when it comes to the bedroom. Mix and match elements pulled from different eras to create a ecclectic space. File this one under a cool bedroom decorating idea we can’t wait to replicate. Hang a diverse mix of over-flowing greens, in lieu of a traditional overhead pendant. Textured bedding and textiles complete the bohemian look. Nothing says “statement wall” quite like a punchy backdrop. Go bold with a charcoal color palette and add warmth via small accents, like throws and artwork. Choose decorative accents with subtle variations in tone and texture to uplift an all-white bedroom. A constant rotation of fresh florals is one way to go about this—subtly tinted linen bedding is another. Swap that clunky table lamp for a wall-mounted sconce that’s minimal in size though not in power. Small space-dwellers, this one’s for you. Low-hanging art helps distract the eye from the lack of a headboard, all the while providing this bedroom with a personalized finish. Bare walls? Opt for a unique storage solution that doubles as a decorative accent or allow your fashion-forward accessories to do the job for you. While we’re on the subject of no headboards, allow us to drop in this inspired alternative spotted in Timothy Goodman’s NYC studio apartment. The defining element of his minimalist bedroom? A personalized neon wall sign that gives his home a retro-cool finish. 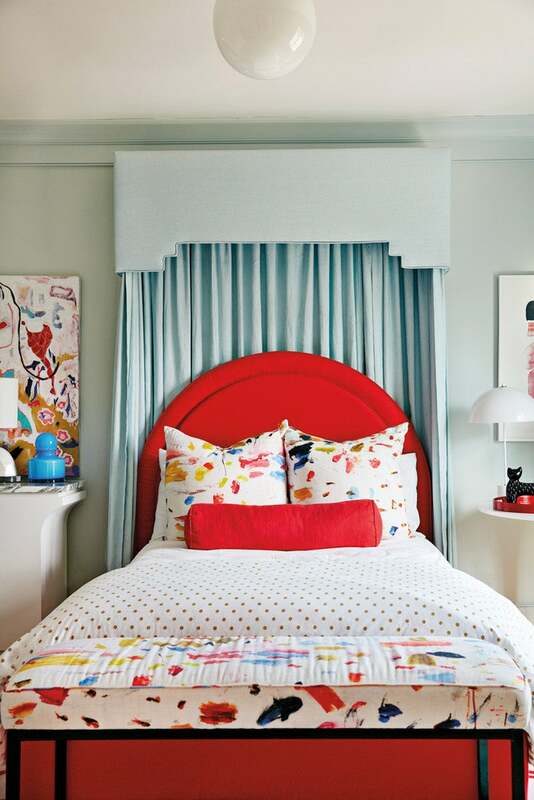 The best small bedroom ideas are often unexpected and what is more unexpected than an unapologetic use of color? This coral-toned bedroom is one fine example of a space that embraces a bold hue in its entirety. Tight on space? Mirrored furniture gives the illusion of a larger bedroom. Choose a mirrored nightstand or even an armoire and relish in its depth-defining qualities.